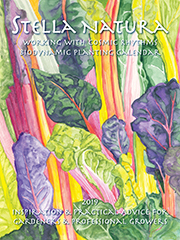 Stella Natura 2019 Biodynamic Planting Calendar and Planting Guide – How is It Used? Rudolf Steiner lectured on agriculture in 1924 at the request of a group of farmers who already appreciated his contribution the understanding of human nature, education, medicine, science, art, religion and more. The insights and practices from his Agriculture Course, known as Biodynamics, have been taken up by farmers and gardeners worldwide. Steiner pointed to the cosmic influences from the sun, moon, planets and stars as important factors to work with in agriculture. Then he challenged his listeners to develop a new science of timing for seed sowing to replace the old proverbs. Considerable research has been done, notably by German biodynamic farmer Maria Thun since the early 1950s, and the Stella Natura charts largely reflect her observations and conclusions. I was introduced to Maria Thun's work while replicating one of her experiments in Switzerland in 1970. The results in the garden made such an impression on me that when I returned to America I began making a calendar for myself, which I shared informally with family and friends. In 1978 this grew to be a more formal publication. More recent modest scale experiments have confirmed my original experience. I realize that this is a science which is both ancient and in its infancy, with many questions still to be explored experimentally. Whereas about half of the biodynamic practitioners in America and abroad guide the timing of their work with the use of such a calendar, others prefer to focus more on the phases of the moon. Biodynamics itself is a much more complex and encompassing approach to agriculture. What this calendar presents is only one small part. I call this a biodynamic calendar because many of the articles are inspired by the foundational concepts of biodynamics and anthroposophy and because I want to encourage people to extend their awareness to the influences of lunar rhythms in agriculture and strive to develop the new science that Rudolf Steiner was calling for. The calendar is meant to be used with common sense and an eye to the weather. The charts can assist you in choosing optimum times to sow seeds, transplant, cultivate your crops and harvest them for storage. If you are not in the habit of allowing other people to dictate your actions, please don't let this calendar be an exception. As editor, I am trusting you, the reader, to think through what is presented here and integrate it into your particular situation in freedom. It would run completely contrary to the anthroposophical world view which inspires this calendar to put forth a set of dogmatic rules that you might feel obligated to abide by. The astronomical information offered in the charts is, like the weather, part of the nexus of environmental factors which affect the plants in your care. If you wish to support their growth by creating optimal conditions, you will want to pay attention to this information – and to the weather! Why are the astronomical constellations used in this calendar different from the tropical signs used in most popular astrology? Maria Thun's experiments with plants have consistently shown the effect of the constellations rather than the signs. The difference between them is explained on page 6 and 7 and page 13. Why do some days say "Root", others "Leaf", etc? Of course all plants have all parts in the course of their reproductive cycle, but most vegetable gardeners are aiming for radish roots rather than flowers, or lettuce leaves rather than seeds. And vigorous, bushy tomato plants with very little fruit can be a great disappointment. For thousands of years, each of the twelve constellations of the zodiac, through which the Sun, Moon and planets pass as they circle the earth, has been associated with one of the four elements. Nearly fifty years ago, Maria Thun discovered that plants sown when the moon is passing in front of a constellation bearing the qualities of the Earth element have enhanced root growth. Results were consistently similar with leaf growth and the element of water, enhanced flowering and the element of air, and fuller development of ripe fruit when seeds were sown with the Moon in relation to the element of fire. In practical terms, this means that it makes sense to try to choose a root enhancing time when sowing carrots, radishes and potatoes. When sowing leafy crops, which include lettuce, cabbage, grass, etc., it is best to choose a leaf time or, second-best, a root time, but to avoid flower and fruit so as not to encourage bolting. On the other hand, annual flowers can be sown to advantage on flower days. Tomatoes, cucumbers, beans, grains and other fruit crops can be sown on fruit or, second best, on flower days. This aspect of the charts refers to the moon's passage through the zodiac. A key to the symbols and the elements is found on page 13 of the printed calendar. What about those crops that are hard to categorize? With most crops the desired focus is obvious, but there are some that are not so clearly related to a particular element. Maria Thun's persevering research is invaluable in these cases. Cauliflower and kohlrabi develop best when sown on leaf days. Broccoli, on the other hand, shows that flower days produce large, firm heads, whereas those sown on leaf days are mostly leaves, and on fruit days there are lots of little buds. Potatoes, leeks and onions, while not technically roots, develop best when planted on root days, when the earth (below-ground) influence predominates. What about cultivation and harvesting? Times that are favorable for sowing are also good for cultivating the same crops. Whenever we cultivate or hoe the soil, even shallowly, we open the ground and simulate current cosmic forces to become active. Harvesting for immediate consumption is obviously done for freshness and convenience. However, it is important to take special care when harvesting large amounts for storage, sale or seed. Leaf days should be avoided because storage crops (such as cabbage, carrots or beets) tend to develop rot, and seed crops tend to be attacked by fungi, due to the predominant watery influence. Therefore it is best to harvest roots on root days, fruit on fruit days (especially during the two week time when the moon is running high), and for leaf crops, either root or fruit days are good, or a flower day for crops in the cabbage family. What do the bracketed areas signify? There are two reasons why you will see some periods of time highlighted by brackets, indicating the same or a different part of the plant from the constellational influence related to the moon. If two planets are at a 120° angle from one another (known as a trine) and they are both in the same element, this elemental influence will either strengthen the Moon's constellational influence if it is the same element, or override it if it is different. Apogee is the time when in its elliptical orbit the Moon is farthest from the earth. The pull of the lunar forces away from the Earth can cause plants sown at this time to send up a flower stalk earlier than usual. This is not a problem when sowing flowering or fruiting crops, but when apogee occurs during a root or leaf time, the time is indicated as [flower]. Why are some times grayed out? The boundaries between constellations are challenging to define. The times of the Moon's passing from one to the next are rounded out to the nearest hour. The changeover is indicated by two hours on either side with gray. There is ongoing discussion as to whether the unequal astronomical constellations, which we see in the sky, or the geometrically equal 30° divisions of the zodiac are most relevant for plant growth. Therefore it makes sense to sow seeds more towards the middle of any given time period rather than towards the very beginning or end, because this is the time they have in common. Maria Thun discovered that the times when the orbital planes of the Moon, Mercury and Venus cross the orbital path of the Sun (known as nodes – see A Brief Outline of Basic Astronomy for the Calendar on page 6 of the printed calendar) are unfavorable for sowing seeds. Therefore, the periods two hours before and after moon nodes and twelve hours before and after Mercury and Venus nodes and lunar and solar eclipses are indicated with gray shading, as times to avoid seed sowing. Perigee is the time in the Moon's elliptical orbit when it is nearest to the earth. Seeds sown at this time, especially in a moist climate or wet season, have been shown to be more prone to attack by fungus and pests. Therefore each month the calendar indicates with gray the twelve hours before and after Perigee. My own experience is that avoiding these times for seed sowing has eliminated the occasional inexplicable crop failures that used to mystify me under otherwise outwardly favorable conditions. What about the phases of the Moon? Here I would like to quote from Rudolf Steiner's first lecture on Agriculture: "Something stupendous takes place on the earth as a result of the full moon's forces. These forces shoot into all the vegetative growth; but only if the full moon was preceded by some rainy days." Water brings "about a distribution of the lunar forces within the earth." These statements have been confirmed by scientific studies showing that plant metabolism, growth rate and water absorption tend to peak around full moon. Ancient Roman traditions advised against felling trees for timber or harvesting crops to be stored for winter at this time, because they would contain too much moisture. The full moon enhances germination. Thus, if you are particularly concerned with the germination of some seeds, you might take care to sow them just two days before the full moon to receive its optimal drawing power. Farm animals, too, may become most fertile at this time of the month. Our endeavor should be to become aware of these things in a new way. The gardening tradition that I learned from Alan Chadwick as an apprentice advised sowing of above-ground crops during the waxing moon, to take advantage of the surge of growth. It advised sowing of root crops as the moon wanes, to give the roots time to establish before the full moon draws the leaves up. Running High and Running Low? Maria Thun has added to this the consideration of the ascending and descending arc of the Moon. Her experience has shown that soils which have been treated with the biodynamic preparations for years are thereby sensitized to the finer cosmic influences. In such soils, the turgor of the sap is increased in the roots of the plants during the two weeks from the running high to the lowest arc. She calls this planting (transplanting) time, and also encourages that rooting of cuttings be done at this time. How can you work with all of these rhythms at the same time? You can't. Some of them go together nicely some months, and other times you simply have to make an informed choice. As you make your choices and observe the results, you may find that you have more of an affinity to working with some of the lunar rhythms than others. In using this calendar, through your observations you join with thousands of people worldwide to further the new science referred to earlier. Please feel free to share your experiences with me or send them to http://www.considera.org. What will happen if I can't sow at the optimal time? Life will go on. This is where the common sense comes in. It seems that family gatherings, graduations, thunderstorms and doctors' appointments are not always coordinated with the planting calendar. So it is helpful to spot a second best time. For example, root and leaf can substitute for one another, and likewise flower for fruit. Afterwards, one can compensate by consistently cultivating in the correct element. If life circumstances construe that one cannot avoid sowing during an unfavorable time, it is better to be conscious of this and try to take special care of the crop by spraying the biodynamic preparations and cultivating at the right times. Attending to the lunar rhythms should refine and enhance one's practices, never paralyze or unduly postpone one's work by causing one to wait for only the most perfect time. Why are the planetary movements included? There is a special column showing the Sun's movement through the zodiac, and the passage of the planets through the constellations of the zodiac is noted at the top left of the monthly charts. The events of their conjunction, opposition and trines are in the charts. And there is a page devoted to the visibility of the planets in the night sky on a monthly basis. All this is to give the real context of the lunar rhythms we are working with. I would consider it tragic if this calendar were to be used merely as a utilitarian tool to improve one's crops. I hope it will inspire a sense of wonder and gratitude towards the powers of the universe which surround us and make our life possible.